There are numerous hotels and motels available to meet your lodging needs while you are attending a graduation at Fort Benning. The nearest hotels are located in Columbus, Georgia. Welcome to the new Holiday Inn Express & Suites, Columbus - Ft Benning, GA! We are only one mile from Ft. Benning Army Base and Army Training School. We are also convenient to the brand new Ft. Benning Infantry Museum that showcases the many men and women who have honored and served in the United States military. The Comfort Suites® hotel is conveniently located with easy access to Interstate 185, just minutes away from Fort Benning. Popular attractions, including Peachtree Mall, The Columbus Museum, the Coca-Cola Space Science Center and Columbus State University are near this Columbus, GA hotel. Closest Hotel to Fort Benning. National Infantry Museum is located just across the parking lot of the hotel. Each of our comfortable rooms features free WiFi, a spacious work area, 37-inch flat-screen TV with cable, and a clean and fresh Hampton bed®. Start your day right with Hampton's free hot breakfast® in our open breakfast area, which features a welcoming fireplace, or if you're in a rush, just grab a Hampton On the Run® Breakfast Bag, available free Monday through Friday. Located adjacent to the main gate of Ft. Benning. Each room has new 25-inch T.V. and coffee maker. Doubles have refrigerators and microwaves. Free wireless high-speed Internet access, Free continental breakfast, Free local calls Free parking, and Outdoor pool. For special Fort Benning Graduation Rate use Corporate Code 0002732775 while booking your reservation. 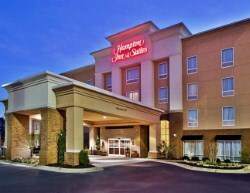 Experience the Hampton Inn & Suites Phenix City, Alabama— a hotel offering rest and relaxation as well as historic and cultural attractions. Located close to downtown Columbus and near the main gate of the Fort Benning military base, our hotel provides easy access to golf courses, museums, nightclubs and entertainment. Recipient Of The 2013 Trip Advisor Certificate of Excellence Award. Microtel Inn and Suites by Wyndham. 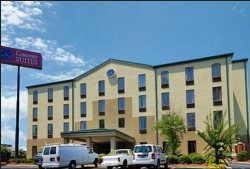 The Microtel Inn and Suites by Wyndham Columbus/Near Fort Benning hotel is conveniently located with easy access to Interstate 185, just minutes away from Fort Benning. The Columbus Metropolitan Airport is five miles from the hotel. Guests will enjoy many superior amenities, including free continental Breakfast, free local and long distance calls within the Continental U.S. The hotel also features an fitness room and seasonal outdoor pool. Pets allowed, up to 2 pets under 25 LBS, in designated rooms for a non-refundable charge of 25 USD per pet. The NEW Courtyard hotel is located in downtown Columbus - Phenix City along the beautiful Chattahoochee Riverfront and only 5 miles from Fort Benning. Located adjacent to Troy University's new campus and across the river from the beautiful skyline of downtown Columbus and TSYS Worldwide HQ. The new state-of-the-art lobby at Courtyard provides greater flexibility and choices for our guests. At the center of it all is The Bistro, your destination for a great breakfast or drinks and dinner during the evening. You'll also enjoy inviting, flexible spaces where you can work or relax, free Wi-Fi throughout and easy access to the latest news, weather and airport conditions via our GoBoard technology. Plus, our well-equipped fitness center and outdoor pool will help you stay refreshed and energized. Whether traveling for business or pleasure, your stay at Courtyard is sure to be more comfortable, more productive and more enjoyable than ever before! FREE Parking for larger vehicles. Located at exit 10 in Columbus, Georgia, Holiday Inn Express & Suites Columbus at Northlake is a short 15 minute drive to Fort Benning and the National Infantry Museum. 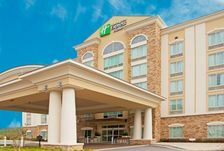 Holiday Inn Express & Suites Columbus at Northlake, primarily an all-suites hotel, features 88 beautifully appointed guestrooms. All guest rooms feature microwave, refrigerator, 32"� flat panel HDTVs with expanded cable packages, high speed wired and wireless internet access, coffee maker, iron/ironing boards, and hairdryers. All rooms feature a work station with telephone and voicemail; free local calls are offered. The hotel also offers an outdoor heated pool, indoor spa, onsite fitness center and business center. Guests are served a complimentary full, hot breakfast each morning and the hotel offers a complimentary manager's reception Monday and Tuesday evening. Additional amenities include 24 hour complimentary coffee/tea service in lobby, onsite guest laundry area, complimentary newspaper, and dry cleaning/laundry service. All parking is complimentary and the hotel is entirely non-smoking. Check out our excellent Phenix City hotel room deals and book your hotel reservation today. Hotel's Location in Columbus, GA Rich in History Convenient and historic, the area surrounding the Candlewood Suites Columbus South hotel is ideal for all visitors. If you're attending graduation at Fort Benning, Georgia, our hotel's pet-friendly accommodations are perfect for you! Come enjoy an apartment-like suite without the hassle of a minimum stay at the Candlewood Suites Columbus hotel! 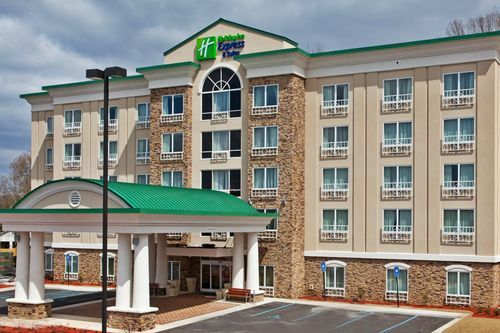 Holiday Inn North Columbus Hotel is the largest full-service hotel in Columbus. We are a great location on the desirable north side of the city and are convenient to Ft. Benning, Georgia with the hotel just 10 minutes away from the main gate. In addition, Peachtree Mall is .25 miles, and Columbus Airport is 2 miles from our hotel. Our features include 224 guest rooms with free wireless Internet access, work desk, speaker phone, coffee maker, iron and ironing board, hairdryer, television with cable channels and pay-per-view movies. Conveniently located on Interstate 185 at Exit Six /Macon Road and only six miles from Ft. Benning, Best Western Columbus enjoys close proximity to Columbus Metropolitan Airport. Complimentary continental breakfast 6:00 a.m.-9:00 a.m. daily Outdoor pool seasonal open dates April 1st until September 30th. Elevator Ice/vending machines, Free wireless internet access available in public areas and all guest rooms Exterior corridor. Within walking distance to theaters, shops, restaurants, and the beautiful Riverwalk. Guests of this Columbus hotel are invited to enjoy free expanded continental breakfast. Free high-speed Internet access in all rooms. All spacious guest rooms include coffee makers, hair dryers, irons and ironing boards. Some rooms have microwaves and refrigerators. Handicap accessible and non-smoking rooms are also available. The Ramada Limited Phenix City, Alabama is Located on Hwy 280 and Hwy 431, 3 Miles west of Downtown Columbus, Georgia and 10 miles from Columbus Metropolitan Airport CSG. The Ramada Limited Phenix City Offers Free Wireless High Speed Internet Access in All Rooms, Wyndham Rewards, a Free Deluxe Continental Breakfast Daily, Refrigerators and Microwaves in All Rooms, Free Local Calls and Free USA Today Newspapers. This Interior Corridor Phenix City Hotel Offers Oversized Guest Rooms with Excellent Guest Service for a Truly Rewarding Hotel Experience. At Motel 6 we welcome our guests 24 hours a day with a comfortable, pet friendly environment at the lowest rates of any national chain. Relax and enjoy WiFi in all guest rooms for a nominal fee. Only 2 miles from Fort Benning, Georgia. 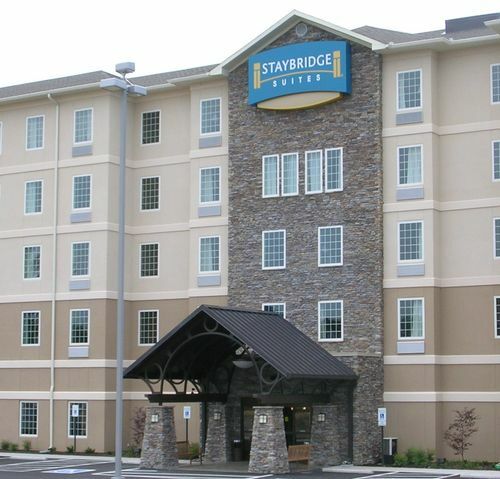 Staybridge Suites hotel provides Guests with all the Comforts of Home. Our hotel is located near Ft. Benning, the Largest Infantry Base. You are minutes away from Corporate Businesses, Ft. Benning, shopping and restaurants with easy access to I-185 and Hwy 80. Staybridge Suites Columbus/Ft. Benning is a Pet Friendly Hotel. Once you stay with us, you will feel like family and feel like you are at home. We specialize in keeping our Guests well accommodated by making you part of our family. The Howard Johnson Inn & Suites of Columbus is located in the Uptown Columbus Historic District, just 6 miles from Ft. Benning. Complimentary High Speed Internet Access in all public areas and guest rooms. Complimentary shuttle to Columbus Airport. Complimentary deluxe continental breakfast daily. We welcome pets, $15.00 non refundable fee per stay. We invite you to stay with us and enjoy southern hospitality at its best. The Quality Inn hotel is ideally located by the Columbus Civic Center multipurpose facility and just minutes from several popular tourist attractions and points of interest. 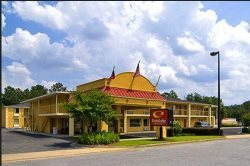 This Phenix City, AL hotel is convenient to the East Alabama Motor Speedway, Fort Benning U.S. Army base and the Columbus, Georgia Convention and Trade Center. All elegantly appointed guest rooms come equipped with refrigerators, microwaves, coffee makers, irons, ironing boards and hair dryers. Non-smoking rooms are available.